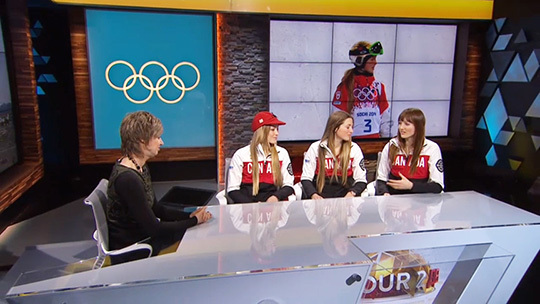 NewscastStudio takes you exclusively inside the Olympic studios for Canadian broadcaster CBC, as part of our continuing coverage. Learn about the journey and the once in a lifetime experience from AKA Design Group. 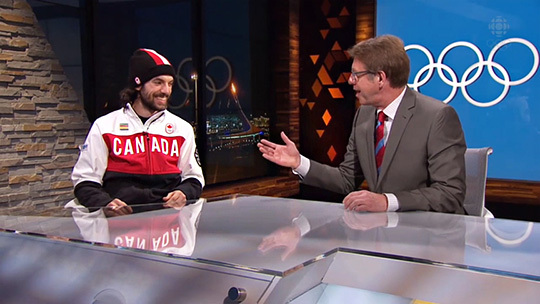 Canada’s Olympic television coverage is a team effort of publicly owned CBC and a partnership with Bell Media’s TSN, TSN2, TSN Radio, Sportsnet and Sportsnet One. Simply put, Canadians were spoiled with wall-to-wall coverage of the Vancouver 2010 and London 2012 games, so expectations were high for 2014 in Sochi. 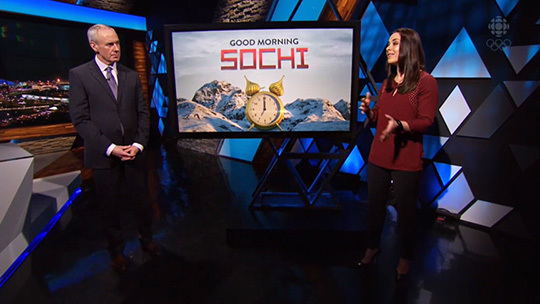 While CBC has previously partnered with TSN’s main channel to deliver expanded Olympic coverage, the multiple partners involved for Sochi 2014 are unprecedented. More than 1,500 hours of Olympic content will be streamed live from Sochi across the networks. 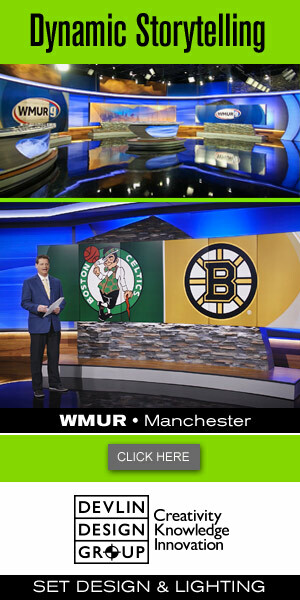 Broadcasting so much coverage in only a short two week window takes a coordinated effort and a studio space equipped to handle the job thousands of miles from home. The 3040 square feet space for CBC at the International Broadcast Centre is divided into three separate studios: the CBC Main Broadcast Studio, the SRC Main Broadcast Studio and a shared Interview Studio. The main design of these three spaces was inspired by both the Sochi diamond graphic pattern seen through out the games as well as CBC’s own motion graphic idents. Straying from the typical blue and white color scheme of winter Olympics, the design of the set incorporates gold hues, hints of red and warmer wood tones. 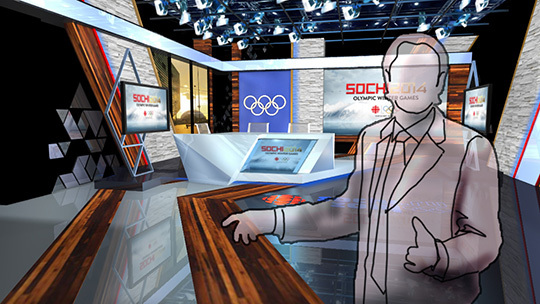 View a gallery of the CBC Olympic Studio and the CBC Olympic Graphics package. Materials were chosen to offer a variety of textures and patterns. Like the Olympic Motif of the quilt work and the cladding of several of the Olympic venues, AKA Design Group chose materials that have inherent mosaic qualities. Coupled with that are surfaces that are sleek and smooth, capturing the slickness of the ice and the aerodynamics of the sporting equipment. LED lighting is employed to provide flexibility of mood and allow the set to alter its look throughout the broadcast day. Internally lit elements are like ice crystals, diffusing light and glowing from within like lanterns. “Neutral colored surfaces behave like a canvas for the lighting to play off, creating an interesting play of shadows, highlights and color,” said Sanvictores. 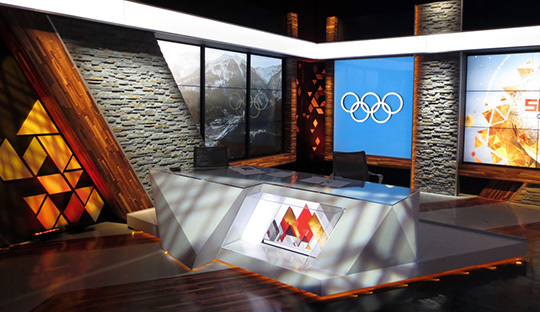 Several video walls give the studios window like views of the Rosa Khutor Alpine events or the Olympic Park and provide time of day reference for the round-the-clock-broadcast. Other video walls provide stand up and over the shoulder graphics and playback content. 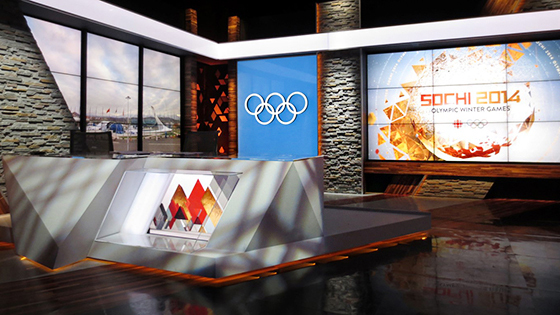 The main desk houses a plasma screen in the front, which can be fed with motion graphics and imagery of the games. “The animation within the desk gives it life, energy and motion,” said Sanvictores. The desk can accommodate up to four comfortably without looking too large and overpowering on-air. The design of the desk is inspired by the snow-capped mountain terrain of the Sochi Mountains. 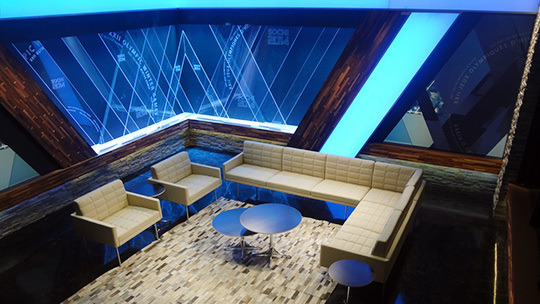 The sleek design complements the surrounding set and is connected by graphics on the floor to other elements in the studio. “In this way the desk does not read as a stand alone piece floating within the space but rather as an component connected and belonging to cohesive whole,” added Sanvictores. The desk features the recognizable slant, creating diamond like facets – an iconic motif of the set and games overall. The space which is shared by both CBC and SRC is meant to be extremely flexible. The overall look and feel are in line with the two main broadcast studios but has a warmer more comfortable and informal environment. It closely resembles a space that viewers at home might be watching the games from, with a Sofa, TV screen, area rug, and coffee table. It is where we get to see a more personal side to the games — chatting with the athletes outside of competition. Large plasma screens can be used as windows to extend the space as well as opportunities for playbacks and commentary. The set was build in Canada the summer before the 2014 games, taking four months to ship to Russia. Benchtop Scenery of Toronto constructed the set. After construction in Canada, the set was disassembled and packed into nearly 12 shipping containers for the voyage to Sochi. After arriving, it was just a matter of reassembling the set, creating a giant jigsaw puzzle for the crew.